Are you ready to help your bread rise into high, billowy, beautiful loaves? Our grandmothers knew that certain ingredients helped bread dough rise faster and higher, have a better texture, and keep longer. These things still work well today! If your bread doesn’t rise as high as you’d like read on! One of the most frequent questions people ask me when it comes to baking bread is how I achieve those big, fluffy loaves. It’s not really a secret – I do what commercial bakeries do. There are a lot of reasons bread doesn’t rise to its full potential, so to speak, but one way to ensure that gorgeous high rise loaf is a dough enhancer. Commercial bakeries use it for a reason. Now, I am not telling you to use bunch of chemicals that you dump into the dough mixture. 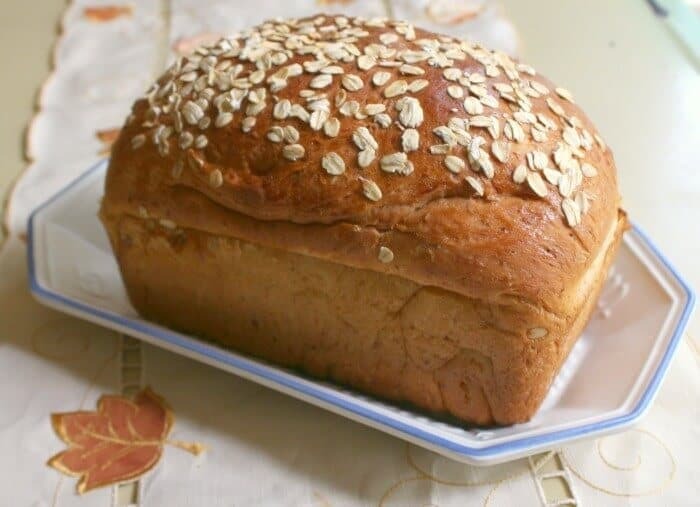 There are lots of natural ingredients that help your bread achieve that gorgeous shape that you are looking for. Here are some of my favorite ingredients to make your dough rise higher. You can use one of them or combine several. Take some time to try them to see what works for you. 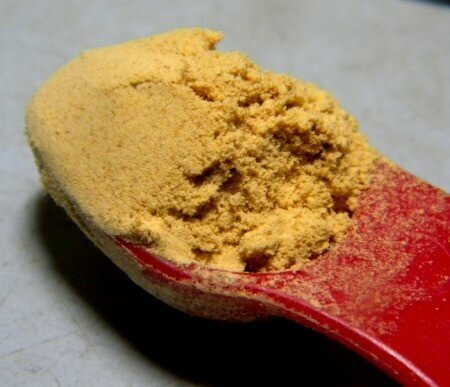 I first learned about adding 1/4 teaspoon powdered ginger from an ancient cookbook. Old cookbooks are one of my addictions and I found this one in a second hand store. That was back when I first started baking bread in 1974. The note to add ginger was handwritten in the flyleaf so I tried it – and loved the result. Ginger is still my favorite additive when I bake bread. The spice boosts the yeast like that first cup of coffee hitting you in the morning, if you know what I mean. The yeast gets more active much more quickly. Add 1/4 teaspoon of ginger in with the water when you are first proofing the yeast to help your bread rise higher and fluffier. By the way? Prior to my posting a bread recipe with ginger in the ingredients list back in 2006 there were virtually NO bread recipes on the internet with ginger as an ingredient. The next time you boil potatoes don’t salt the water. When the potatoes are done save that cloudy water in a Mason jar tightly covered in the fridge. Then, when you are ready to make your fluffy loaf of bread, warm the potato water to 110F and use it in place of the water in the recipe (in equal measure). This works well to help your bread rise because of the potato starch in the water. The starch encloses the gas bubbles in dough and strengthens them. 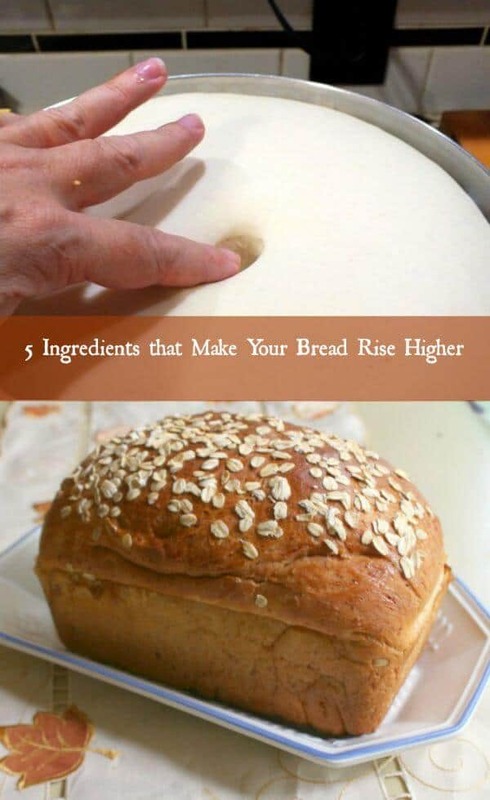 That makes your bread rise lighter and higher. Of course it also gives a pleasant flavor and I feel good about being as frugal as my grandmother was! Don’t keep potato water more than a few days, though. It sours and can really smell up your kitchen. Wheat gluten is present in all wheat flour and it is the substance that gives the dough that elastic feel. It strengthens the dough and holds the gas bubbles produced by the yeast and to make the bread rise higher. You can buy vital wheat gluten, which is just the gluten. Substitute 1 tablespoon gluten for 1 tablespoon flour in each cup of flour for whole wheat bread and about half that for white. So, if your recipe calls for 8 cups whole wheat flour you’ll remove 1/2 cup of the flour and add 1/2 cup of gluten. Add with the flour. If you’re making pizza dough or Italian bread you can add about 1 1/2 tablespoons per cup of flour to give your bread that chewier texture. Adding 2 tablespoons instant dry milk powder per loaf of bread will help your bread rise higher, stay soft, and hold the moisture longer. That means it won’t get stale as quickly. Dry milk powder creates a more golden brown crust and improves nutrition, too. Add it with the flour. Don’t use this in your artisan type breads that have a coarser crumb but it will help sandwich loaves have a soft crumb — especially good when it comes to wheat breads. The acid of the vitamin C helps the yeast to work better and also acts as a preservative by deterring the growth of mold and bacteria. I toss the contents of a bottle of vitamin C tablets in the blender, turn them into a powder, and then store it in a Mason jar. I use 1/8 teaspoon per loaf of bread, adding it in with the flour. Yeah I know. More than 5 ingredients to help your dough rise because this is number six. Let’s think of it as a bonus, ok? If you want to take the time to make a homemade dough enhancer mixture this one is pretty good. Store it tightly covered in the refrigerator. Mix together and store in an airtight container in the refrigerator. Add 3 tablespoons for each loaf of bread a recipe makes and it works like a charm. There are other additives you can use, of course. In addition to the ones mentioned above people add dried potato flakes, lecithin, vinegar or a variety of other ingredients. I tend to stick with those listed here because in the 41+ years I’ve been making bread they haven’t let me down! The following are affiliate links. If you click through and buy I get a small commission that helps to support the blog. Thanks so much for being a part of Restless Chipotle. Just about a year ago I wrote and published a bread making book, Bread Bootcamp: It’s Not a Cookbook…It’s an Adventure . I took all of the questions y’all have asked me over the years and created a bread baking course that takes you through the process from the basics to the advanced. You start easy then get to the more complicated recipes. By the time you finish the book you can make a variety of breads. I am currently working on a follow-up book but that’s a few months out. If you are serious about learning to bake bread this is the book to get. What role does the gelatin and the pectin play? I just like to understand these things. Thank you. They help stabilize the proteins in the flour, I believe. Can i use Vitamin C with wheat flour and AP flour combination? I use sourdough starter in our breads, even the regular recipes with dry yeast. My question is, can I use your dough enhancer without the C? Will the ginger be ok? Also, I used to use potato water because grandma did, but when I retired and started this Sourdough adventure, I stopped. I think I’ll go back to using it when possible! Thanks so much. You should be fine without the C.
I’ve always used it within a short period of time. I’d think at least a month or two. Will any of these tips work using almond or coconut flours? I don’t think so, Tammy. 🙁 they need gluten. I live in North Texas and it has been raining for a week now so when I read rainy days were good I decided to make you honey buttermilk bread. Beautiful, I have never gotten this kind of rise. Thank you for this. Hope I can use use the ginger in my roll dough. You can totally use the ginger in any recipe calling for yeast. I hear ya about the rain… we’re in North Texas as well and our property is bordered by two creeks so we’re watching them fill up! I am so glad you like the recipe! !